If you’ve ever wondered what would happen if Siri were made to talk to itself, wonder no more! A video uploaded earlier today shows exactly what would happen, and the results aren’t very pretty. Siri was part of the three all-new features for the iPhone 4S which itself was announced at Apple’s Let’s Talk iPhone event at Apple Town Hall at the company’s own campus in Cupertino, California about ten days ago. Siri, as most of you will know, allows folks to use their iPhone 4S’ many features through voice alone. The commands and queries that Siri can take are, of course, from humans. Things, we must assume, would get quite messy when you pitch one artificially-voiced Siri against another and that is exactly what Gizmodo has done: Using two iPhone 4S units, Sam Biddle managed to ensure that when one Siri said something, the other would be taking input. The entire conversation goes from bad to worse quite quickly, and it is something you should definitely check out (link given at the end). We’re finding Siri—smart as she/he/it is—has some trouble understanding us mere mortals. But what about two formidable AIs matched against one another? They converse like two mental patients. Once Siri is activated – either by pressing Home button or holding it up to your ear – you can command Siri to do some specific task for you or answer a query. The variety of commands Siri can take is amazing: you can set reminders/alarms/calendar event, call people, email them, text them, ask Siri to play a specific song, give directions to get you home/office, tell you the weather and much, much more. Besides this, you can ask Siri different questions like, say, “what is $199 in British pounds?” and it will get the information from Wolfram Alpha. It can even access Yelp’s database to inform you about local restaurants, shopping centers and other services when you need it. 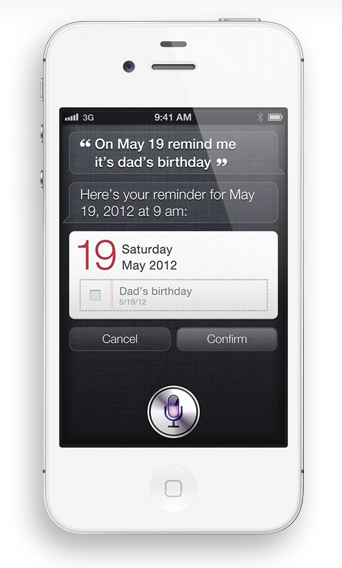 A video was posted earlier today which showed Siri ported to the iPhone 4. At the moment, though, this port of Siri isn’t working perfectly: it doesn’t take voice input since Apple servers won’t accept voice commands unless they are from an iPhone 4S. Due to a limitation of sharing videos from Gizmodo’s site, you have to view the video embedded here on the original post itself.